Pyrex glass ovenware has been essential kitchen equipment since the early twentieth century. It was first marketed in the UK just after the First World War and became a hit with many households. Top London stores Harrods and Selfridges proudly advertised Pyrex cookware. In the 50s Pyrex took on a fresh, new, modern look thanks to designers Milner Gray, Kenneth Lamble and John Cochrane. These designs had a timeless elegance that make them just as good today as they were in the 50s and 60s. Pyrex was first marketed in 1915 by Corning Glass Works in the US. Corning developed it from glass used to make lamp bowls for the US railroad. The railroad needed the lamp bowls to be hard wearing and stand extremes of temperature. The formula was also ideal for glass cookware. Corning used the trade mark 'Pyrex' to sell this new glassware to the domestic market. Pyrex bowls could withstand oven temperatures without cracking and made better use of heat, reducing cooking times and making sure of even cooking. In the UK Pyrex cookware was available from Harrods as early as 1919. The original advert from Harrods stressed that you could see the food in Pyrex bowls, making them more attractive to serve food in than old pots and pans. The original Pyrex range of bowls and oven glassware included Pyrex oval and round casserole dishes, Pyrex round baking dishes and pudding dishes, a Pyrex covered stew pot, Pyrex au gratin dishes and a flat Pyrex serving tray. The casserole dishes had ornate lids. From 1923 the English glass maker James A Jobling of Sunderland started to make Pyrex under licence in the UK. Harrods stocked the full range of Pyrex ovenware made in the UK by J A Jobling. Harrods' 1923 offerings included Pyrex oblong utility dishes for roasting Yorkshire pudding, Pyrex casserole dishes, Pyrex round cake dishes, Pyrex tart dishes and Pyrex oval eared dishes for fish. There was also a Pyrex gift set for 30 shillings which included a range of Pyrex cookware products: casseroles, bread and cake dishes, round and oval Pyrex dishes and Pyrex ramekins. By the 1920s, it was possible to get most of the Pyrex cookware you would expect to buy today. As well as the familiar Pyrex ovenware, J A Jobling also made Pyrex laboratory glass. Selfridges also sold Pyrex cookware and advertised Pyrex cooking demonstrations in the 1920s to customers, which were held in their china and glass department on the third floor. Pyrex was such a novelty that it was advertised as a leading product in these top British department stores. In those days it was more often bought by the lady of the house for use by her servants. Its unbreakability was a key selling point. Pyrex was also manufactured in Germany in the interwar years. William Wagenfeld studied design at the influential Bauhaus School of Design and in the early 30s he produced a range of new designs for Jenaer Glaswerk, which manufactured Pyrex in Germany. The designs were simple and elegant and a significant advance over what James A Jobling was producing in the UK. UK consumers had to wait another twenty years for more modern looking Pyrex cookware. Like many companies J A Jobling continued with designs little changed from the pre-war days in the early years after the Second World War. However, in the early 50s they engaged Milner Gray and Kenneth Lamble of the Design Research Unit to revamp their range. Milner Gray help set up the Design Research Unit in the War years to produce Utility designs for the Government. After the War it became a design business. Gray and Lamble's designs were simple and modern. They designed the very familiar Pyrex casserole dish with a flat lid for J A Jobling, as well as a range of Pyrex tableware. Designer John Cochrane also worked for J A Jobling in the 50s. His designs included Pyrex oblong roasting dishes, and Pyrex round bowls. J A Jobling found other uses for Pyrex glass in the 50s. 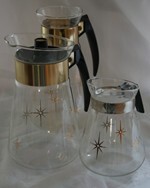 They introduced a range of fashionable tea and coffee making equipment. Drinking tea was a suburban ritual in the 50s. This elegant tea maker, right, has an infuser suspended on a chain. It dates from 1959. Coffee though, was the drink of the time, with coffee bars springing up all over Britain. Coffee became the drink of the young in the 1950s. This Pyrex coffee set, left, would have been purchased by a young couple in the early sixties, for a fashionable modern home. The pattern has gold stars, which was a very fashionable look in the early sixties. This design represents a departure from the elegant, but functional, look of the Pyrex cookware. From the late 50s, glamour, as well as modern design was an important selling point. In the 60s J A Jobling produced these patterned Pyrex casserole dishes. pictured right. They represented a departure from the clear cookware the Company had previously made. The casserole dish on the stand could be kept warn with a candle, or spirit burner underneath. The pattern illustrated on the right, comprising different vegetables, was known as 'Harvest'. This design was also produced in other patterns. Left, Gaiety, comprising snowflakes. Pyrex sold well in the 60s, but J A Jobling was keen to maintain its selling price. However, in 1965 J A Jobling announced that it would no longer enforce retail prices and that the retail price was a recommendation only. Supermarket chain Victor Value immediately cut prices of Pyrex cookware by fifty percent. For the 70s Pyrex produced these attractive tumblers with a coloured plastic base and handle. There was a brief fashion for this type of glassware in the 70s. There were cheaper imitations as well as this Pyrex classic. Although, Pyrex sold well in the 60s and 70s, its profits were dependent upon raw material costs. In 1973, J A Jobling's parent, the Thomas Tilling Group, sold its majority share to the original US makers of Pyrex, Corning Glass Works. Pyrex in the UK had come full circle back into US ownership. For collectors a clue to the date of UK Pyrex glassware is the presence or absence of the letters JAJ of James A Jobling. Older Pyrex is often referred to as JAJ Pyrex by collectors. For 1974, Pyrex marketed Stack'n'Store jars with cream or milk chocolate coloured plastic lids. They sold for £1.78 for two one litre jars with different coloured lids. Pyrex cookware continued to sell well in the 70s and 80s. Pyrex still makes its classic range of glass cookware. The casserole dishes are of similar design to the clear glass designs produced since the 50s. There is now an improved grip on the handles. For more on modern Pyrex designs see www.pyrex.com. "I wish to obtain pyrex oval casserole with lid size - 21cms/8 1/4" long can you advise me where they may be obtained - thanks for your assistance." 8 fl oz/half american pint so far. "Can you please tell me if it is safe to use Pyrex glassware made in the 1950s in a microwave ? "Today in Oxford I purchased three Pyrex nesting mixing bowls for Â£3 at a car boot sale. I felt like I stole them. They are pastel: pale yellow, pale pink, pale turquoise with no outer patterns. After getting them clean, the mark on the bottom is printed backwards and there appears to be an elongated, 3 prong crown with the PYREX cupping the crown, all letters backwards. I still have Â£3 worth of usable bowls but do I have a collectable or a fake? "Need 3 quart, round glass pyrex casserole to fit into my silver chaffing dish. Can't find one ANYWHERE in the 3 quart ROUND size. I am wondering if you could please share the history of Pyrex that is clear glass and in a silver serving tray. I recently found one, that I believe is a meat tray. The clear glass tray has four feet and fits nicely into a silver (plate? oxidized?) serving tray. I am so excited to use it the next time we grill! "Hello, I have 3 Pyrex turquoise Snowflake saucers. They have the JAJ Crown logo but with backward lettering? "Hi, I have just bought a Pyrex casserole dish in the black snowflake Gaiety pattern, and the PYREX lettering on the base is backwards...a Collector from America is keen to buy it from me,but I am unsure what to charge, is this very rare and what sort of value does it have ? Would really appreciate any information on this one. "I have found a shallow JAJ Made i England dish in my cupboard.Is it microwaveable?